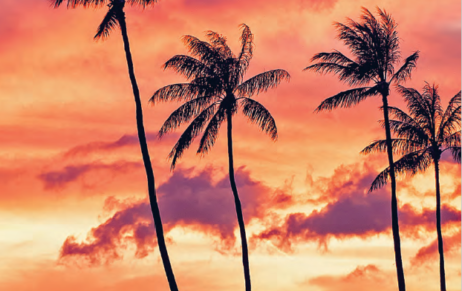 For a quick Hawaiian getaway with all of the creature comforts of a capital city, you can’t beat Honolulu – where hundreds of surfers wait for the perfect wave just steps away from some of the world’s best shopping. Stay in Waikiki at Halekulani, one of the most iconic hotels in Hawaii. Its namesake suite, the Halekulani Suite, shows how Halekulani earned its name “house befitting heaven.” Your semi-private elevator opens into a small foyer where your personal butler waits for you, ready to help with anything you may need. Heaven, indeed. The 3,320 sq ft two-bedroom suite is decorated in soothing colors with an elegant Asian-influenced design, including a spa-likemaster bath. To recover from your travels, spend the day at the pool, then indulge in a Lomi Lomi Hawaiian Massage at the spa before ordering in-room dining on your covered lanai. Enjoy a Mai Tai at sunset and take in the stunning views. On one side, high-rises seem to explode straight out of the crystal clear turquoise waters of Waikiki Beach. On the other side, you’ll find a mountain that did, in fact, explode from the waters – 300,000 years ago when Lē‘ahi, or Diamond Head, erupted, forming the amazing crater. This contrast of modernity and nature’s raw power is absolutely captivating.